Tom and I have quite different food tastes. Peas, onions, tomatoes? I love. He hates. He realized this week he’s not a fan of creamy avocados, either, while I recently jumped for joy when I found a deal on a bag of four at Trader Joe’s. 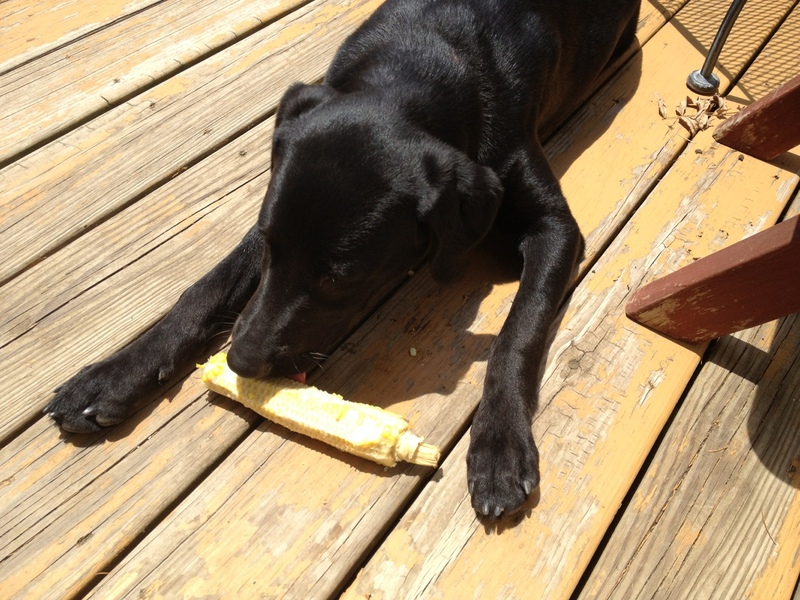 Fortunately, we do both like corn on the cob, especially the sweet, crisp corn in the middle of the summer. And Rachel likes our leftover cobs. We also like pie. 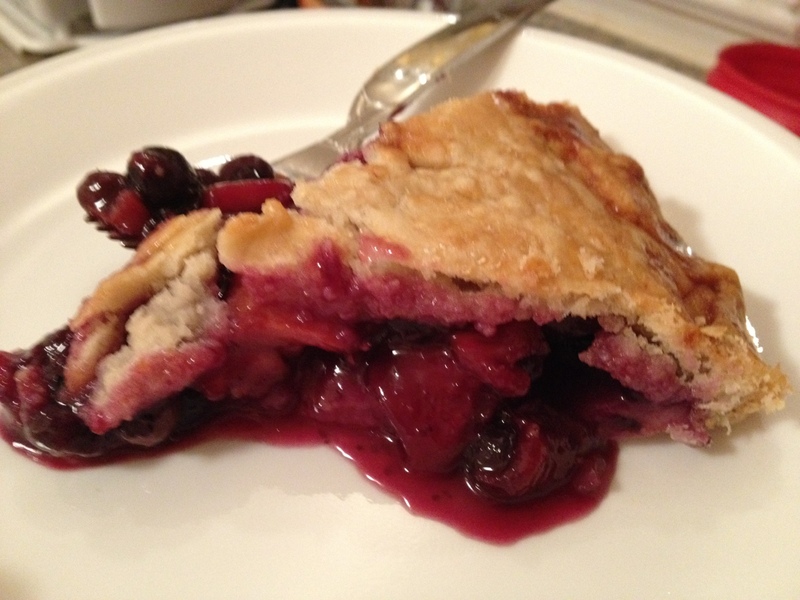 He helped me make an outrageous blueberry-nectarine pie for Tuesdays with Dorie. It disappeared too fast. I put together this quick summer salad/salsa for lunch just for myself one day when when Tom was at his own family’s home during his East Coast visit. It was good that I didn’t try to serve him a bowl of it, because when I made it again for a snack/dinner later in the week, he made a face at it! He ended up with a basic cheese quesadilla and his favorite 5-ingredient food processor salsa. So if your name is “Tom,” you may hate this healthy dish: It has tomatoes, avocados and green onions! 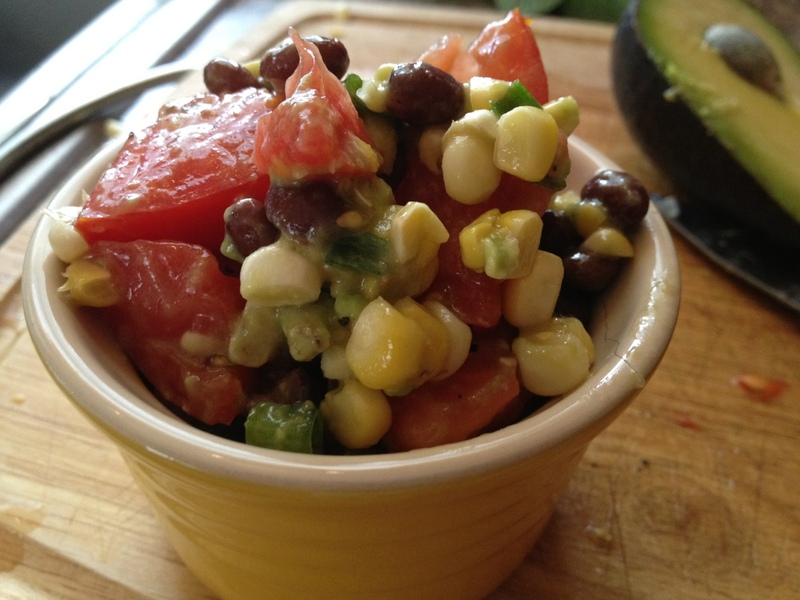 But if you’re anyone besides my boyfriend, you may absolutely love this summertime salad/salsa of bold flavors — tomatoes, corn, avocado and black beans. This can be a meal on its own or a side dish. Eat with a fork or with chips. Be flexible. It’s delicious. These following amounts are very rough estimates, so change as desired. 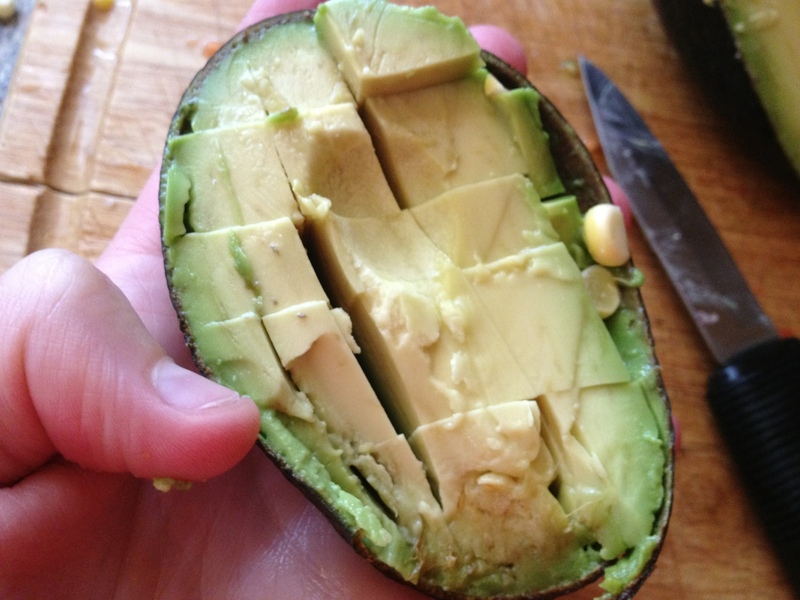 This could also be great with a little jalapeno, it you have some. About a half-cup tomatoes — mix up any kinds you have around. I cubed one tomato from my garden and halved a handful of colorful farmers market tomatoes. About a half-cup of black beans. 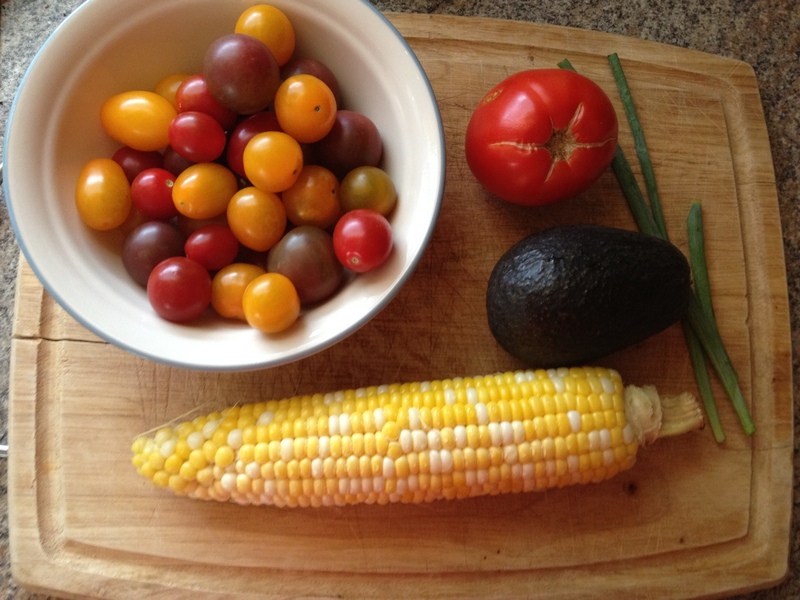 Mix all vegetables together in a bowl. Add a squirt of fresh lemon juice, a tiny, tiny bit of oil, and salt and pepper to taste. Enjoy! Every time you write about Tom on your blog, my heart flutters. You two are so damn precious. And ps I want to come visit you one day! Charlottesville really isn’t that far from Fredericksburg, and I haven’t seen you in forever. I would love to cook and/or go out to eat with you sometime!! I must have dropped him on his head and scrambled his taste receptors when he was young. It looks pretty darn good to me. I know that he turns up his nose at a lot of foods, but I give you so much credit for expanding his food horizons. He eats so many new foods since you began dating! I love how he tries your new recipes (or some of them, anyway)! 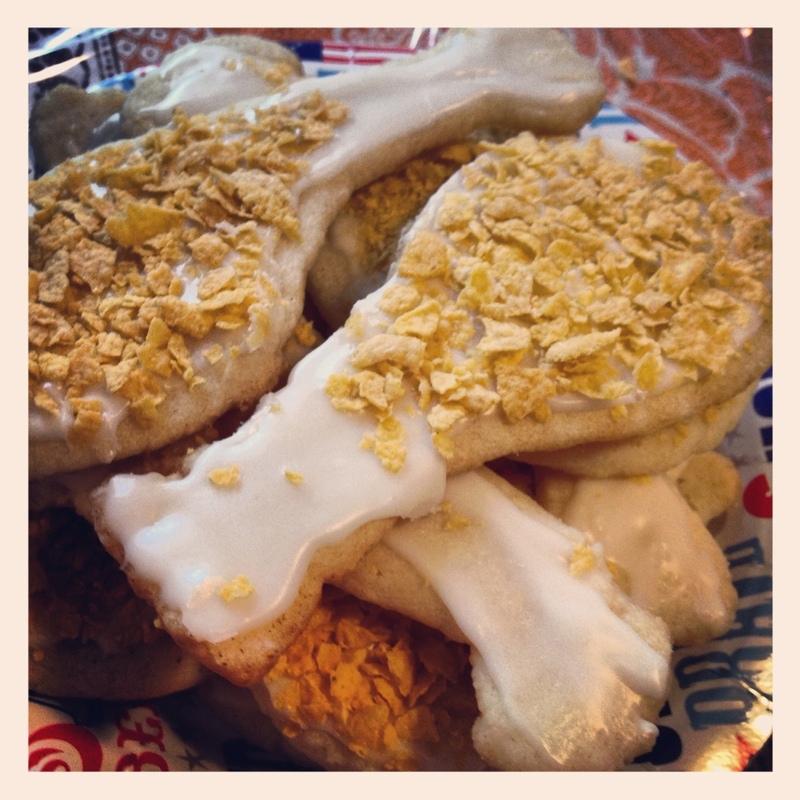 Your cookies are so cute!